Beverly Wang appeared on Show 184, recorded in August 2008, at age 17. 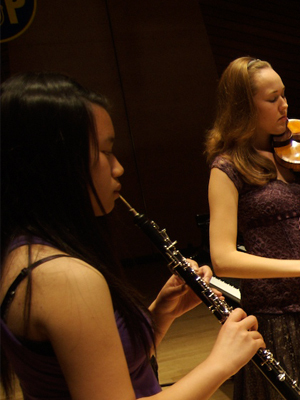 The Oboe Quartet is composed of oboist Beverly Wang, 17, from Toronto, Ontario, Canada, violinist Mikaela Holland, 16, from Bellevue, WA, violist Meredith Treaster, 16, and cellist Emma Bobbs, 17, from Pepper Pike, OH. Emma is a recipient of From the Top’s $10,000 Jack Kent Cooke Young Artist Award. The quartet is coached by cellist Darrett Adkins, who coordinates the string chamber music program at Aspen Music Festival and School. Beverly is a Jack Kent Cooke Young Artist.